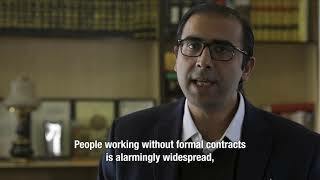 (New York, January 23, 2019) – Pakistan’s government is failing to enforce laws that could protect millions of garment workers from serious labor rights abuses, Human Rights Watch said in a report released today. The report “No Room for Bargain,” documents a range of violations in Pakistan’s garment factories. They include a failure to pay minimum wages and pensions, suppression of independent labor unions, forced overtime, insufficient breaks, and disregarded regulations requiring paid maternity and medical leave. Human Rights Watch also identified problems in the government’s labor inspection system. Pakistan authorities should revamp labor inspections and systematically hold factories accountable for abuses. Domestic and international apparel brands should take more effective measures to prevent and correct labor rights abuses in the factories that produce clothing for them.